Any Steel Ornamental Fence of $4,000 or more. Valid through April 30, 2019. Model and Style – Ameristar offers a wide range of fence product lines, from lighter-duty residential ornamental products to maximum-strength industrial styles and grades. All have similar appearance, so your choice of model will determine a large part of your project’s price. 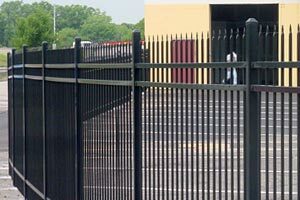 Total Length – Steel ornamental fencing is priced by the linear foot, as are all materials. The more distance your project covers, the more expensive. Height – The taller your fence will be, the more materials are used in panels, pickets and posts. Steel fence panels range in height from 3 feet to 8 feet or more. Cost is directly related to height, proportional to the amount of materials used. In many cases, your choice of height is flexible. 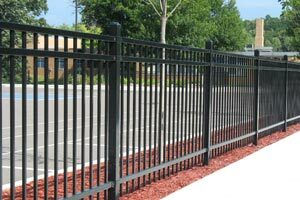 Material Grade – Ameristar fencing comes in four distinct grades, from Residential to High Security. Each grade has its own dimensions for posts, rails and pickets. The heavier the grade, the higher the per-foot cost for pre-assembled panels, posts and gates. Gates – Your choice of the number, size and type of gates for any project affects the total price. Gates are more expensive, per foot than fence panels, due to heavier construction, but also reduce the total length of the run of the fence. Gates are available in all grades. Accessories and Options – Many decorative accessories are available for a more customized appearance. All are priced individually. Options such as gate operators, security latches, and others also affect the overall project price as well. Additional Materials – Concrete for installation of posts and other materials may be required for a specific project. When we quote you a price for full installation, these materials will be included in our calculations and a comprehensive, all-inclusive estimate. Installation – If you choose to have your fence installed by our experienced, quality-oriented installers, the cost of installation will be based on total man-hours, equipment being used, and other factors. Installing a steel ornamental fence takes roughly the same amount of time as an aluminum fence. 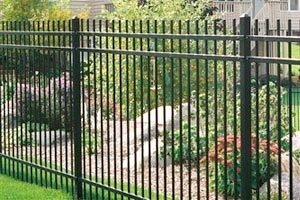 As the Minneapolis St. Paul area’s leading fence supplier and contractor, our prices for all metal fence materials, including Ameristar Montage ornamental steel products are highly competitive. Our volume purchasing power results in deep wholesale discounts, and we pass those savings along to our customers. By maximizing the efficiency of our outstanding, efficient and hardworking installation crews, we are able to further control costs for our residential and commercial customers when we make complete installations. Our dedication to exacting and professional installation ensures the longest possible life for every fence. That means a lower annual cost and less maintenance over the lifetime of the project. Our quotes and bids are always complete and are without any hidden charges. When comparing estimates, always compare identical materials and services on a point-by-point basis. Contact us to discuss your needs and let us consult with you at no charge and provide you with a quote for the total cost of materials and installation.